OUT OF STATE ADOPTIONS: We do allow out-of-state adoptions for dogs, however, the adopter MUST come to Houston to get the dog and take the dog home with them. We do not allow our dogs to be shipped. Also, our puppies can only be adopted to the immediate Houston vicinity as it takes 4 months to get them completely vetted at our vet here in Houston. We will not allow our dogs/puppies to be adopted out of the area without being spayed/neutered. We spay/neuter puppies at 4 months old. **SPECIAL NEEDS** Hi! 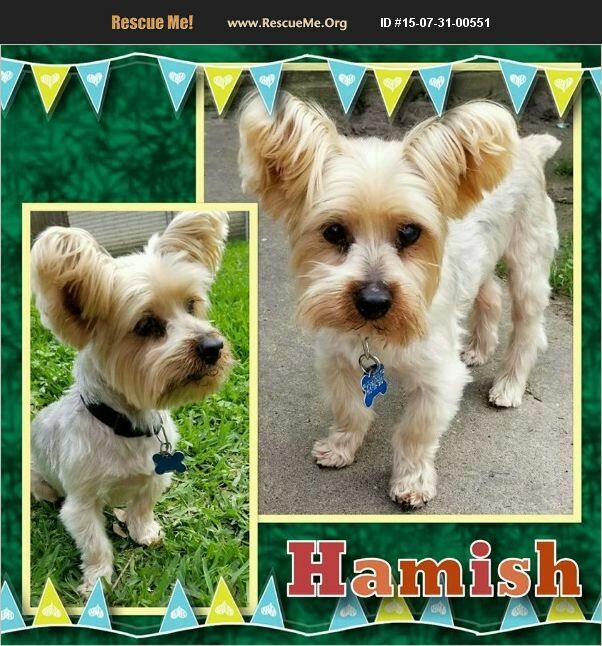 My name is Hamish and I'm a senior male Yorkie looking for a home as special as me. I am blind and, because I can't see what's going on, I feel my way around. I've been blind for a while so I can get around great! I have these big, awesome ears that help me hear what's going on and I get the layout of a room really quickly. However, if there are things moving around in that room all the time, like toddlers or other dogs, it's hard for me to figure out what's going on and puts me a little on edge. I absolutely love short walks around the neighborhood! If you ask me if I 'wanna go for a walk?' I'll start jumping and twirling, then wait patiently for you to put on my harness so we can go for a very leisurely stroll...emphasis on the leisurely. I mentioned I can't see, right? I love figuring out new environments and it takes a bit for me to feel them out. I also do all my business outside and will make sure to let you know if it's time for me to go out. Even though I am a little older than the other dogs at the Adoption Center, I've been well cared for and am in great shape with no other health issues. I do, however, have a little bit of separation anxiety. I feel the best if I'm in the same room as you so I can hear/smell you and know I haven't been left alone. It would probably be best for me to get adopted by someone that works from home or is retired. Don't worry! I can be left alone and I won't mess anything up. I just shouldn't be left home alone all day, every day because it makes me really sad and I have been known to cry/whine. I sleep in my foster family's bedroom at night in my own little bed on the floor and am perfectly happy there the whole night through. I'm not fond of a crate but I'm potty-trained and not destructive, so it's not really necessary anyway. I'm really hopeful the perfect family is out there looking for me the way I'm looking for them. I know it's a tall order to fill, but I'm such a good pet. Loyal, sweet, and super cuddly. I've got a new lease on life and want to make sure I'm sharing it with my forever family! Please consider opening your heart to a senior gentleman like me! Male Yorkie that we estimate to be born around 8/1/2005 and weighs 9 lbs. PUPPIES: Young puppies that have not had their second round of puppy shots will not be at the Adoption Center for our weekend adoption events. If you are interested in adopting a puppy, please fill out an application on our website http://www.k-9angelsrescue.org/k9_angels_rescue_adoption_process.html. If your application is approved, a meeting can be arranged. Also, we only adopt young puppies locally due to the 4 month time frame it takes to get them fully vetted and altered. SPAY/NEUTER: As we believe proper healthcare of one's pet is a requirement of good ownership K-9 Angels Rescue only adopts out dogs that have been fully vetted. If the dog being adopted is not already altered at the time of their adoption, the dog will be altered within 2 weeks of adoption at our vet at our cost, with the exception of puppies which will be altered as soon as the puppy is ready. NOTE: All dogs are officially the property of K-9 Angels Rescue until they are altered by our veterinarian. Please LIKE and share our Facebook page: www.facebook.com/k9angelsrescue.